With the holiday season in full swing, everyone is looking at holiday traditions, family togetherness and celebrating with everyone. When it comes to holiday traditions, there are some classic ideas and preparations that have stood the test of time. 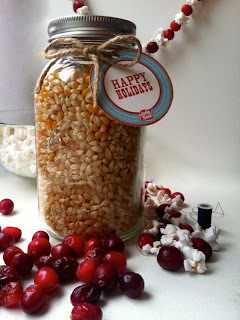 One fun holiday activity is decorating and/or cooking with popcorn and cranberries. While I like the idea of stringing a garland of popcorn and cranberries, I am a little realistic. We tried the idea for the kids' tree. But, the kids ate more popcorn that the amount strung on the garland. Still, the important part of the activity was that we were together and having fun. This time around I think that making a fun treat out of popcorn and cranberries might be a more successful event. This year Jolly Time popcorn has teamed with the Wisconsin based cranberry farm, the Habelman Bros, to provide some wonderful treat suggestions using popcorn and cranberries. So, on a cold, dreary winter afternoon, the kids and set off to have a little fun. Since snow has been missing for almost a year, the kids have been deprived of snowmen. We decided to make some frosty friends out of popcorn. On the Jolly Time website, we found the recipe for Holiday Popcorn Snowmen. With our popcorn popped and ingredients set, we were ready to create our masterpieces. Unfortunately, our snowmen did not turn out like the picture (somehow boys like zombie snowmen that are quite messy). But, the important thins is that we had fun and made a great holiday memory. This year ditch the boring holiday cookies. Sit down with your kids or friends and make a popcorn creation for the season. Get some recipe inspiration at the Jolly Time website. From snowmen to garland, the options with popcorn and cranberries are bountiful.